Led by L’Garde Inc., of Tustin, California, this Solar Sail demonstration will enable propellantless in-space navigation for missions such as advanced geostorm warning, economic orbital debris removal, and deep space exploration. This story was updated at 4:15 p.m. EDT. NASA has picked a deep space atomic clock, a giant solar sail design and a novel laser communications system as the must-have technologies to help future space exploration, agency officials announced today (Aug. 22). NASA plans to pump a total of $175 million into three demonstration missions — one for each pioneering technology — with launches anticipated by 2015 or so. The three were selected as part of NASA's Technology Demonstration Missions program, which seeks to infuse high-impact tech into the agency's future space missions. "These technology demonstration missions will improve our communications, navigation and in-space propulsion capabilities, enable future missions that could not otherwise be performed and build the technological capability of America's space industry," said NASA chief technologist Bobby Braun in a statement. After retiring its venerable space shuttle fleet last month, NASA is now transitioning to focus on reaching destinations in deeper space. President Obama, for example, has directed the space agency to get astronauts to an asteroid by 2025 and to Mars by the mid-2030s. 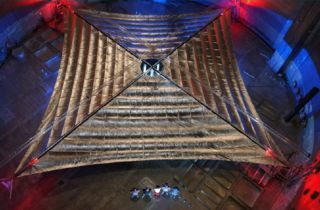 The solar sail demonstration mission will deploy and operate a sail seven times larger than any other one ever flown in space, researchers said. That huge sail size makes this mission considerably different than small-sail projects like NASA's NanoSail-D, which was launched last year mostly as a proof of concept, officials said. "This concept takes it much further than that," James Reuther, director of the Crosscutting Capability Demonstrations division at NASA's Office of the Chief Technologist in Washington, told reporters today. "It actually deploys a sail that's 38 meters by 38 meters [125 by 125 feet], which is big enough to actually enable a mission." The technology could thus help develop deep space missions that cruise through the cosmos without using any traditional propellant. It could also have other applications, officials said, such as helping set up systems to monitor space weather and clean up orbital debris. The sail should be ready for flight in three years, officials said. The project will be led by principal investigator Nathan Barnes of L'Garde Inc. in Tustin, Calif. Led by the California Institute of Technology Jet Propulsion Laboratory, the Deep Space Atomic Clock (DASC) team will develop a small, low-mass atomic clock based on mercury-ion trap technology and demonstrate it in space, providing the unprecedented stability needed for next-generation deep space navigation and radio science. The deep space atomic clock project will fly and validate a miniature mercury-ion atomic clock 10 times more accurate than today's systems, officials said. That kind of improvement is a big deal, because precision timing is vital to the navigation and performance of any deep space mission. This project, which is led by Todd Ely of Caltech and NASA's Jet Propulsion Laboratory in Pasadena, Calif., should also be ready to go in about three years. The third funded technology is an optical in-space communication system, which would send information streaking through space encoded in laser beams. The advance could let spacecraft transmit data up to 100 times faster than before. "It'll be like going from home dial-up Internet service to broadband," NASA deputy chief technologist Mike Gazarik said. The clock and laser systems should provide synergistic results that together greatly improve spacecraft navigation and communications capabilities, officials said. Together, the two technologies "should enable the ultimate long-distance call," Reuther said. "Combining these navigation and communication systems will allow spacecraft to communicate more quickly and effectively than ever before." The laser project, led by David Israel of NASA's Goddard Space Flight Center in Greenbelt, Md., should be ready to fly in four years, officials said. After its flight test, the technology will be qualified for use by near-Earth and deep space missions requiring high bandwidth and a small ground-station reception area. The three projects were chosen from a pool of 47 proposals. While NASA plans to set aside $175 million to support the demo missions, that budget is contingent on future funding availability, officials said.